I haven't been able to identify this weed which is prolific on the gravel (and garden beds) on the rooftop of my 10-storey condo building in downtown Vancouver, BC. Can anyone identify it and let me know what I should do about it? 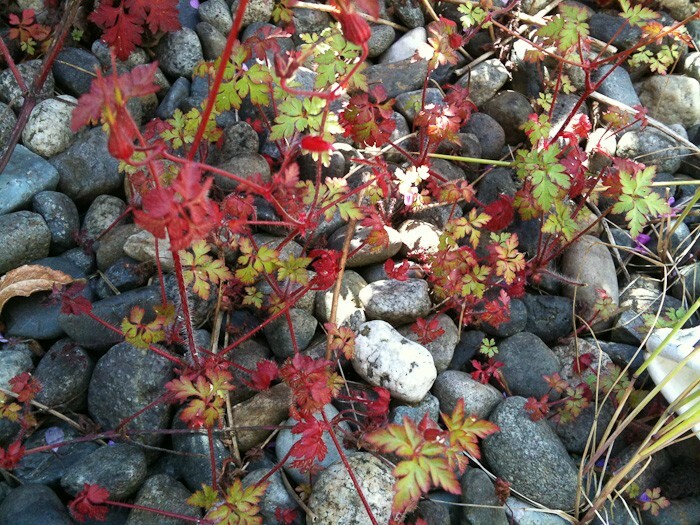 It has shallow roots, hairy red stems, red/green leaves, and little white flowers. 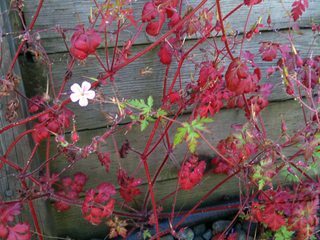 Looks like herb robert to me (geranium family). I remember it taking over parts of my parents' garden in NE USA and that it was a bit of a nuisance. What to do about it depends on how you want to control it. It's an annual/biennial, so individual plants shouldn't last more than two years, but it spreads like crazy via seed. If you don't want to use chemicals, I suggest just keep pulling out plants (which have shallow root systems and are easy to pull), making sure you get any adults before they produce and disperse seed. Could take a few years doing it this way as there's probably a considerable seed bank. Alternatively, look into safe herbicides for a faster result. It looks kind of like red-stemmed filaree Geranium, also known as Stork's Bill. Is there a bit of pink in the flower? You may find some good information in this article, Stork's-bill increasing across western Canada. You can kill it with Roundup or just pull it out. 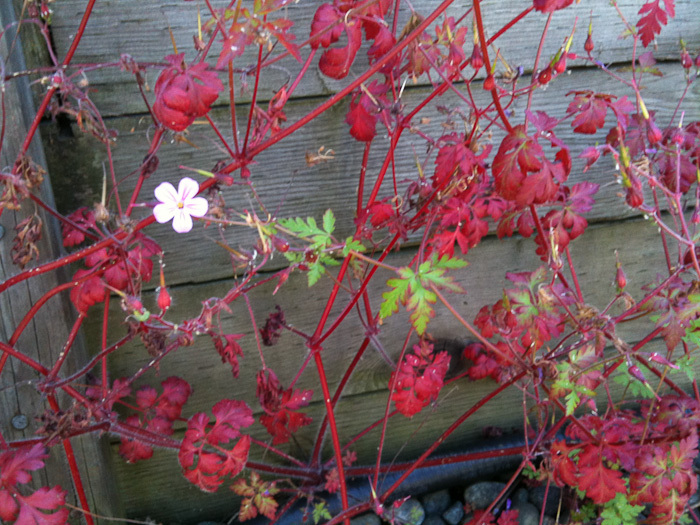 It is Geranium robertianum, see Wikipedia page for more information. This common species in the occidental european area is widespread and have a strong variety concerning the leaves shapes and the colors. A lot of scientific publication deals with this question. Generaly it prefears mid-shadow places. Not the answer you're looking for? Browse other questions tagged weed-control identification or ask your own question. Vine-like, deep-rooted very aggressive weed - what is it and how do I get rid of it? What is this shrub with small red flowers, found in St. Lucia? What is this houseplant with white-speckled red and green leaves?